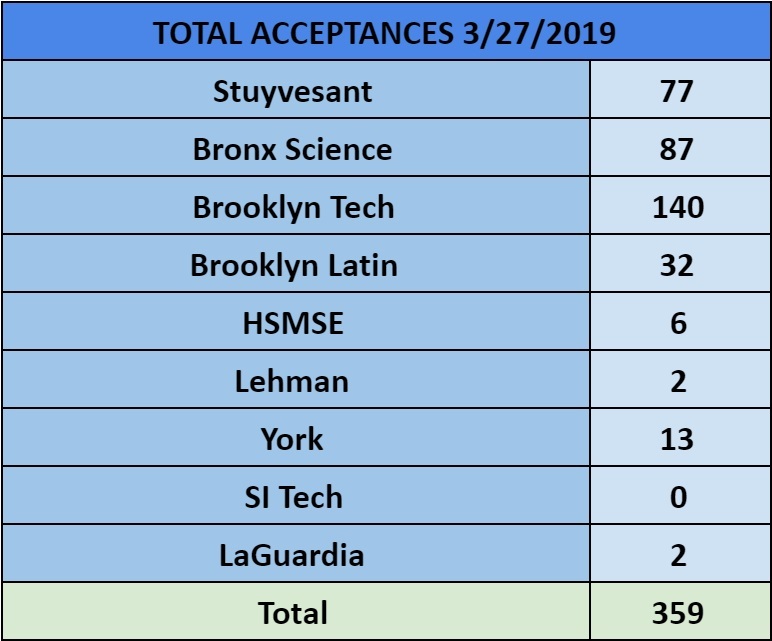 New York, NY - March 26, 2019 – After a year of hard work, hundreds of families visited their local KT center for SHSAT Acceptance Weekend 2019. This year, Khan’s Tutorial helped 359 students gain acceptance into New York City’s prestigious Specialized High Schools. Families celebrated the success of their students and also received invitations to KT’s Annual SHSAT Awards Ceremony taking place at the Colden Auditorium at Queens College next month. Since 1994, Khan’s Tutorial has helped over 3,357 students gain acceptance to the Specialized High Schools. Currently, Khan’s Tutorial student, Alif Miah, has been named KT SHSAT 8th Grade High Scorer, scoring a 670 on his way to Stuyvesant High School. Also, KT SHSAT 9th grade High Scorer Saptarshi Barua, scored a 665 which is an impressive score for the challenging 9th grade SHSAT. In addition to Alif & Saptarshi, Khan's Tutorial boasts several high scoring students who scored above 600 and gained acceptance to the original three Specialized High Schools. “It’s my favorite time of the year here at Khan’s Tutorial, and we’re thrilled to have helped so many students gain acceptance to the Specialized High Schools. I’d like to thank our dedicated SHSAT team for always keeping our curriculum current and competitive, leading to KT helping over 356 students gain acceptance for the third year in a row. We’re proud to say that in fall of 2019, over 9% of Stuyvesant’s incoming freshman class will be made up of KT students, over 11% of Bronx Science’s class will be made up of KT students, and over 8% of Brooklyn Technical High School & Queens High School for the Sciences at York College’s classes will be made up of KT students,” said Mohammad Hossain, Director of the SHSAT Program & Vice President of Khan’s Tutorial. “This past year we’ve expanded our scholarship program, making all KT students eligible and rewarding top scorers with free workshop classes, bootcamp classes, and mentorship. In addition to The Dr. Mansur Khan SHSAT Opportunity Scholarship Program we’ve partnered with Harlem DreamChasers and The Brooklyn Technical High School STEM Program to help NYC students from all backgrounds gain acceptance to the Specialized High Schools. Since our start in 1994, KT has helped over 3,354 students gain admission to these competitive schools, many coming from working class, new-immigrant minority families. It is our goal to make quality education, whether it be accelerated programs or access to top high schools, a reality for all students in NYC. Congratulations again to all of our SHSAT families,” said Dr. Ivan Khan, CEO & President of Khan’s Tutorial. This year Khan’s Tutorial has helped 35 underrepresented students gain acceptance to the Specialized High Schools as the official tutoring partner of The Brooklyn Technical High School STEM Program, through its partnership with Harlem DreamChasers, and through its SHSAT Program & the Dr. Mansur Khan SHSAT Opportunity Scholarship Program. Due to the success of increasing diversity at the Specialized High Schools, Khan’s Tutorial was recently featured in the New York Post. “Ivan Khan, who heads the service, characterizes test-prep as helping ‘kids finish the race.’ But ‘preparation began years ago in elementary school and in the home,’ he told The Post. Vital to success, he says, is maintaining a rigorous academic pipeline,” – New York Post.